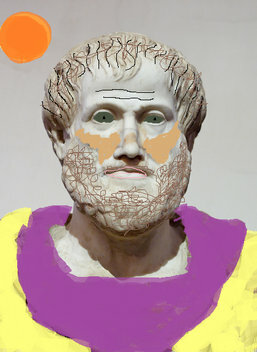 Aristotle often noted that "Man is by nature a fashionable animal". I spruced him up a bit, what does Feed-Forward think??? I dare you to do one of a non-European artifact / portrait. HAhaha :) Any suggestions? I do have what I call "Fresh Prints" http://www.feed-forward.net/a.1161_Fresh_Prints Or did you mean something else??? Whats going on here::?? I try to look at this guy and his eyes catch me in mid-stare. Did they possibly come from, "Medusa?" I see that I have made a fashion statement with you. I always wear bright togas at home. With Barb, we usually just wear, nothin. Thanks for the feedback on the orange soda pop/pea soupa. Barb says, "hi". She has not had a chance to get to you shiiiiz-site, yet. I got to go, now. She is watching. It's part of a series! I learned from watching you!!!!!!! !